Boutique-style resort hotel on Coligny Beach with Tiki Hut beach bar and oceanfront roomsHome to the only bar on the sand, Beach House, a Holiday Inn Resort stands out among Hilton Head hotels on the beach. 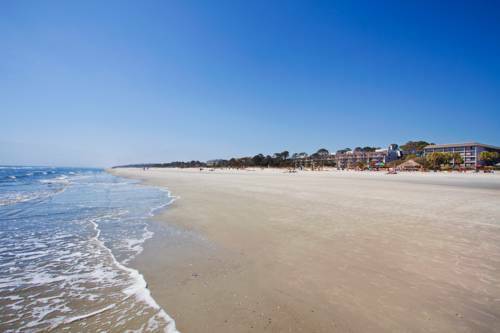 Fronting the Atlantic Ocean on the islands popular Coligny Beach, the resort is a five-minute walk from the movie theater and over 60 shops and restaurants at Coligny Plaza. If youre looking for family-friendly fun, head to the Coastal Discovery Museum for Lowcountry history, nature trails and a camellia garden, or visit the nearby Harbour Town Lighthouse.More than 60 miles of bike-friendly paths make the island ideal for exploring on two wheels, and our on-site beach volleyball court is perfect for friendly competitions.When youre ready to relax, lounge by the pool, play in the surf or hit The Porch Southern Kitchen & Bar for local shrimp and grits or baby back ribs. In the evening, catch live music over cocktails at the Tiki Hut, or settle down by the warming firepit to watch the sunset.After a lively evening, our welcoming rooms are just steps away. Our Ocean View and Patio rooms offer a front row experience to the year-round live music at the Tiki Hut.Are you searching for an unforgettable setting for a conference, party or wedding? Our unique beachfront areas and 3 event spaces can accommodate up to 375 guests. The Porch Southern Kitchen & Bar: Wholesome comfort food meets Southern hospitality at Porch Southern Kitchen and Bar. Savor Lowcountry cuisine whenever the mood strikes. Whether dining in a cozy booth, poolside, or around the outdoor fire pit, enjoy great food and drinks in good company. Sand & Surf Ballroom: The Sand & Surf Ballroom is 3,060 square feet divisible into 2 sections; The Sand Room is 2,040 square feet and The Surf room is 1,020 square feet. The Sky Room (level2) is 1,852 square feet and has views to the ocean and an outside deck. Sky Room: Offering sweeping views of the Atlantic our oceanfront Sky Room is the perfect venue for your next meeting or reception! Ocean Room: The Ocean Room is perfect for board meetings and includes an outdoor deck great for breaks or a cocktail after the meeting. Located on the main level, the Ocean Room looks out across the oversized firepit, Resort Pool, and to the ocean beyond. The Mall at Shelter CoveShelter Cove Towne Centre ~ A place to Live, Love, Laugh and Play! Located at the heart of the island, a beautiful architectural landscape with something for everyone. Coligny Plaza (60 Shops)Over 60 shops and restaurants, with specialty stores, entertainment by local talents, and scrumptious restaurants. Van Der Meer Tennis AcademyOffering adult and child tennis clinics. South Beach Marina Village/Harbour TownHarbour Town is the centerpiece of Sea Piines Plantation, home of the famous "Hilton Head Lighthouse". Arts Center of Coastal CarolinaLocated in the heart of Hilton Head Island, the award winning regional Arts Center of Coastal Carolina is a remarkable showcase for professional performing and visual arts, as well as cultural festivals and educational outreach. Coastal Discovery MuseumThe Coastal Discovery Museum's mission is to teach the public about the natural history and cultural heritage of the Lowcountry. Pinckney Island Wildlife RefugePinckney Wildlife Refuge is a 4,053 acre refuge that includes Pinckney Island, Corn Island, Big and Little Harry Islands, Buzzard Island, and numerous small hammocks. Pinckney is the largest of the islands and the only one open to the public.